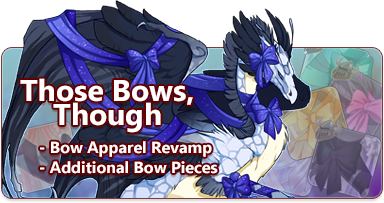 It's been 84 years, but we've got those extra bows you asked for. A soft and shimmering pink ribbon tied into the perfect bow. A spool of pretty pink ribbons. Includes Pretty Pink Neck Bow, Arm Bow, Tail Bow, Head Bow, Leg Bow, and Wing Bow. A spool of pretty aqua ribbons. Includes Pretty Aqua Neck Bow, Arm Bow, Tail Bow, Head Bow, Leg Bow, and Wing Bow. A spool of pretty buttercup ribbons. Includes Pretty Buttercup Neck Bow, Arm Bow, Tail Bow, Head Bow, Leg Bow, and Wing Bow. A spool of pretty white ribbons. Includes Pretty White Neck Bow, Arm Bow, Tail Bow, Head Bow, Leg Bow, and Wing Bow. The height of elegance, this shimmering blue ribbon is tied into the perfect bow. A spool of sparkling blue ribbons. Includes Sparkling Blue Neck Bow, Arm Bow, Tail Bow, Head Bow, Leg Bow, and Wing Bow. A spool of black ribbons. Includes Black Neck Bow, Arm Bow, Tail Bow, Head Bow, Leg Bow, and Wing Bow. This silky dark red ribbon is tied into the perfect bow. A spool of dark red ribbons. Includes Dark Red Neck Bow, Arm Bow, Tail Bow, Head Bow, Leg Bow, and Wing Bow.